I would have thought packing for my three-week journey to Israel (Sept 14 to Oct 6th) should have been an easy decision. It wasn’t. As David (my husband) and I looked over the abundance of items that came in for me to take to Israel, we knew we had to make decisions; what I could take and what would be left behind. It became quite evident that the decision would be hard knowing that people in Israel were awaiting the items. The donations included medical, basic needs and a jewelry making business. In the medical donations was something called “wound packs” that we understand are life-sustaining and are very costly (we were told over $500 each); we had 11 of them. The other medical supplies included gloves, tubes of all sorts and hip and knee replacement packs. The basic need items of new towels, washcloths and toiletries are always appreciated in the storehouses that help the needy and new immigrants to Israel. I often visit the hospitals giving out small toys, crayons, markers and coloring books but began to see that these items weren’t as high on the list as other things. The content of the jewelry-making business weighs over 120 pounds. It consists of gold and silver fittings as well as an abundance of precious and semi-precious gems and stones. There is a family who is anxiously awaiting the supplies to begin a jewelry business. As we prayed two sayings came to our hearts. 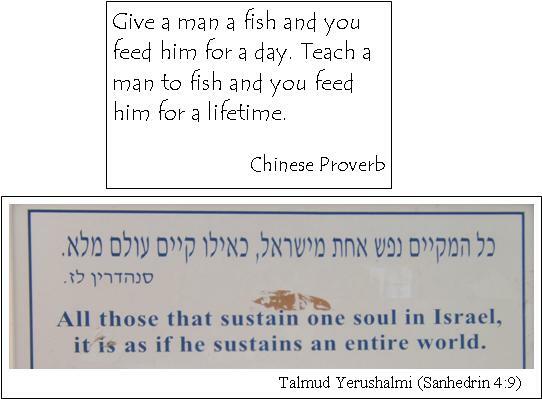 The first a Chinese Proverb, the second a quote from the Jewish Talmud. Looking over the items we saw that we were sustaining lives with the medical equipment and we had supplies so a family could “fish for themselves”. Oh my, what a very hard decision that had to be made with only a few hours before my departure. While thinking about how we can sustain Israel the last scene of the movie “Schindler’s List” came to our remembrance. For those who have seen the movie Oscar Schindler was given a ring. The ring was formed out of the gold from the teeth of the persecuted Jews and engraved with the above saying from the Talmud. We opted to sustain lives, something my ministry does with the ongoing grocery voucher ministry that provide for Messianic families in Jerusalem, Israel. By choosing to first take the medical supplies, we believe that we are continuing to sustain lives. As a side note, I always like to share when I have opportunity to speak is that in the hospitals in Israel there is no such thing as a “people group” such as Arab, Christian or Jewish. Arab doctors and nurses take care of Jewish and other patients and Jewish doctors and nurses take care of Arabs and others. When in need of medical attention there is no cultural barrier. So sad that you won’t see that on your television. After making the choice to take the medical supplies we set aside the other items knowing that God had a plan to get them to Israel at the appointed time. I gathered three suitcases from the closet. My baggage allowance states that two bags are permitted for free and each additional bag is an additional cost. We felt the $200 additional baggage fee was a small price to pay so I could transport as many medical items as possible. We packaged some space bags with as much of the supplies that we could as they were light-weight, but bulky. ﻿We packed every square inch of the suitcases and off I went to Israel. The journey was good. I’ll be posting some of the highlights of it in the future, so please check back to my blog. Even with a good journey there was still a bit of feeling that I hadn’t completed my mission. I often thought about the items left behind; there was still the jewelry making supplies for the family. So upon arrival home I began to look over my schedule knowing that I needed to return to Israel soon. “How soon” you may be asking? Well, soon . . . like next week . . . like in three days. I was awaiting a few more things to come into place with the very busy life I lead. The last thing I needed to have happen, happened around noon today. So now I am “getting it together” as fast as I can so I can leave on Monday. Let’s just say that I will sleep on the plane. Here’s the time-line of this trip; it’s going to be a quick one. I depart on Monday, Oct 25th and will be returning on Nov 4th. This time with the “fishing supplies” for the family’s business to go forth as well as another mission that will have to wait for me to write about later. Many thanks for your prayers and support. Getting the jewelry business to Israel is going to require three checked pieces of luggage so everything can be taken at one time. The family lives in the Be’er Sheva area and have been some of the persecuted Messianic Believers that you may have heard about. (That’s a story for another time.) As I packaged each gem and stone by color and shape I became overwhelmed how much was there. Oh my goodness, there are a lot of items. I was told about $5000 worth and it is very heavy, a “dense weight” heavy. So, as you all know I’m not shy to tell you I need help. If there is anyone who is willing to help me with the costs of the additional baggage to get the jewelry to Israel? I also need finances for some of my misc. costs for the trip (like renting a car so I can take the jewelry items to the family in the Negev desert). If so, you can go to my web site for more information how to donate. www.HereToTheNations.com It won’t matter if you send donations while I’m flying and am in Israel, it will get to me, but I do have immediate need for everything to fall into place. I wrote an article a number of years ago called “The Plan according to Isaiah” that I’m posting to this blog to help you understand the non-Jew portion of why we must be helping Israel according to Scripture.